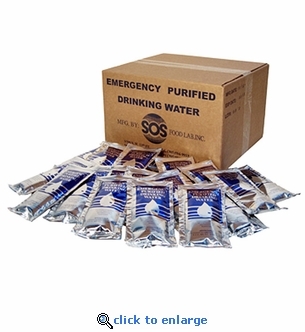 This case of SOS Purified Emergency Drinking Water Pouches (96 pouches) can be vitally important in any emergency or disaster where the water supply is disrupted. These purified, bacteria free water pouches have a 5 year shelf life and are individually date stamped for accurate and safe storage. The superior tri-laminate packaging makes them extremely durable with no leaking. One case equals emergency rations of water for one person for up to 48 days. 4.227 oz. of purified drinking water per pouch. Extreme Temperature Tolerance: 40° F - 230° F without damage or leaking. Easy tear open pouches, no scissors, tools or cups. Dispensing is fast and easy in an emergency.